This interview was initially published by The Williams Record on February 11, 2009. 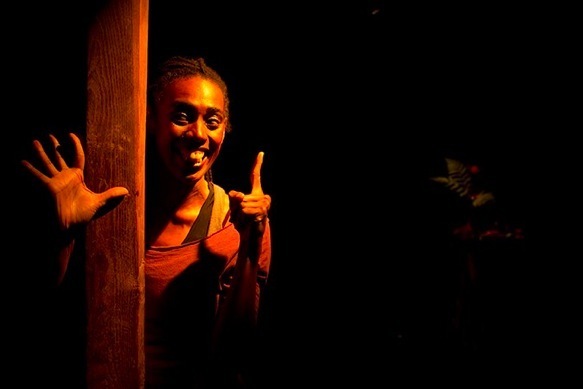 After her Womb-Words, Thirsting solo show in the Adams Memorial Theatre Thursday evening, Lenelle Moïse, renowned poet, playwright, screenwriter and performance artist, reflected on her own performance as well as the outcome of Claiming Williams with Lisa Li, executive editor. How did you come to devote your life to writing about issues pertaining to race, gender, class and sexuality? I am committed to telling challenging and entertaining stories that inspire people to act for social change. When I was a student, I desperately wanted to have conversations about race, class, gender and sexuality with my peers but, in our culture, there are too few examples of how to do this with celebration and without censorship. I quickly realized that talking from my heart was an effective way to communicate what was going on in my head. Poetry is the language of the heart, so some of my work spins sociological theory into poetry. And over time I’ve learned that – contrary to popular belief – talking about race, class, gender and sexuality can be a lot of fun. The words “black” or “feminist” or “immigrant” or “lesbian” might intimidate on paper but when you meet me, I’m just a down-to-earth poet with a pocket full of stories to tell. I feel collective laughter is a bridge to collective understanding, so I lace the painful truths with humor. It’s like that line from Mary Poppins: “A spoon full of sugar makes the medicine go down.” Events like Claiming Williams are good medicine. I think “Womb-Words, Thirsting” brought a little sugar to the table last week. What did you hope to accomplish with your performance? As an activist – I write to inform and to incite necessary debates. As a theater artist, I aim to inspire, to affirm, to empower, to unify, to rock minds and to open hearts. I feel successful when the staging of my work creates a safe forum for audiences – diverse in age, race, class and political affiliation – to breathe, clap, sigh, weep, learn and laugh together in one packed room. I always hope my audiences will realize their connectedness in the live moment. We might feel like separate individuals, couples or cliques when we walk into a theater but when we walk out, the event should have reminded us that, ultimately, we are all in it together. How did you think your performance fit in with the rest of the Claiming Williams events and lectures? “Womb-Words, Thirsting” is a lot about finding home and feeling safe, which was one of Claiming Williams’ central themes. You have performed on campus twice this year, did you notice any changes between the two experiences? The crowd was bigger and more boisterous the second time around – and thank goodness! After a day of lectures and community forums, people seemed to walk into the Adams Memorial Theatre warm and ready to relax, relate and release. You went to some of the other lectures – what did you think about those experiences? Dorothy Allison is one of my favorite writers – ever! In person, she has such grounded, folky grace, easy eloquence, deep wisdom, unabashed confidence and generosity. It was a treat to hear her speak first thing in the morning. I also appreciated alum Kiana Green’s [’07] first professional talk about Sakia Gunn. I discuss Gunn’s story as part of “Womb-Words, Thirsting” so it was a relief to have her name already floating in the collective consciousness on campus. What did you think of Claiming Williams? Did you think it was successful? I perform and lead workshops at colleges across the country and I think every school should create a day like Claiming Williams. You’re really onto something necessary, unique and empowering here. Ignorance is not an excuse for bias-related incidents in a diverse, academic environment. Claiming Williams gave students, staff and faculty a safe space to start talking about the tough stuff. As the day progressed, I saw community members balance critical thinking with heart-to-hearts. You know, integration isn’t just Dr. Martin Luther King Jr.’s dream anymore – it’s our everyday reality. Claiming Williams has the potential to build a bridge to connect us safely to that reality. The event was successful. I was honored to be a part of it. It’ll be even better in the future. And I’d join you again.